It’s Spring in Jackson Hole! While the skiing is winding down and the valley is greening up, the off-season is a great time to experience Jackson, Grand Teton National Park, and Yellowstone National Park. Follow along below for some itinerary ideas you can take advantage of in April and May. Morning- During your first day in Jackson, head on into town for breakfast at one of our cozy and delicious options around the square where you can sit down and enjoy the ambiance, or take something to go and explore town's unique shopping scene. 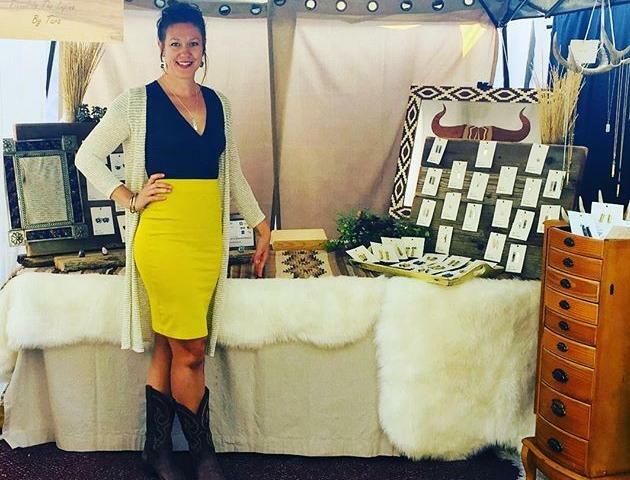 Local brands surround the four antler arches, making it easy for you to navigate yourself around the square and to hit up some local favorite spots to pick up souvenirs, jewelry, apparel, art, and more. 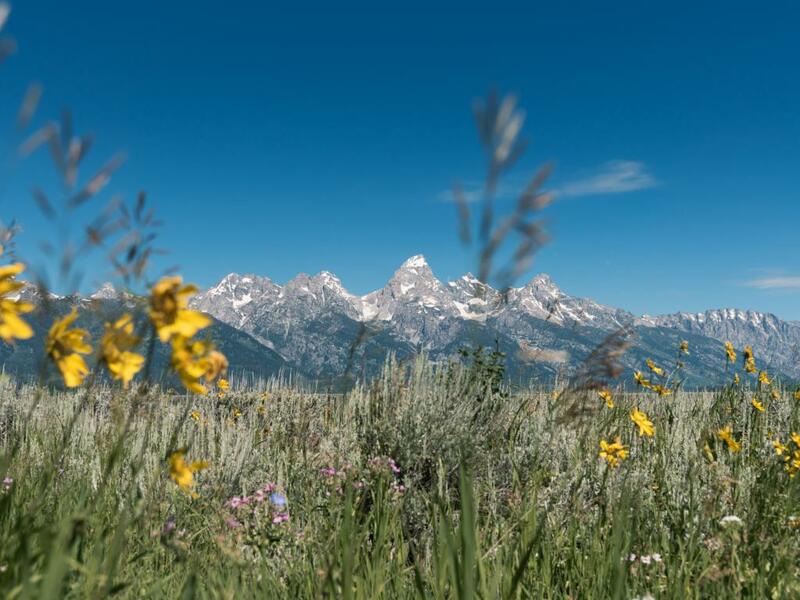 Once you've filled your bellies and taken in town's culture, gear on up and get ready to take on a scenic bike ride with A+ plus of the Tetons. Afternoon- Did you know that there are many different ways you can bike around Jackson? With bike shops sprawled around town, and at times offered at your hotel, too, you have a great variety to choose from. Mountain biking for the adventurous, fat tire biking for those who want more of a challenge, cycling for those who want to work a sweat with a view, electric bikes for those who don't want to work up a sweat (trust us, we won't judge you--they are amazing! ), and of course just some classic road and pathway bikes for those who want to be in the moment and maybe even stop a few times to get some of those iconic Grand Teton shots. Our pathways around town, in Wilson, and in Grand Teton National Park are some of the most well-kept ones out there and we can't wait for you to check them out. If you had a short bike ride or are ready for more of the great outdoors, we suggest making your way to one of the many fishing guides and anglers to teach you the peace and mind meditation activity that is fly fishing. Learning how to cast along the Snake River, even if you don't catch anything, is a great way to get the views AND relaxation. Ready for some grub and a cold beer after working up a sweat? Jackson has quite the impressive list of brewpubs around town that can help replenish you have a morning of biking. 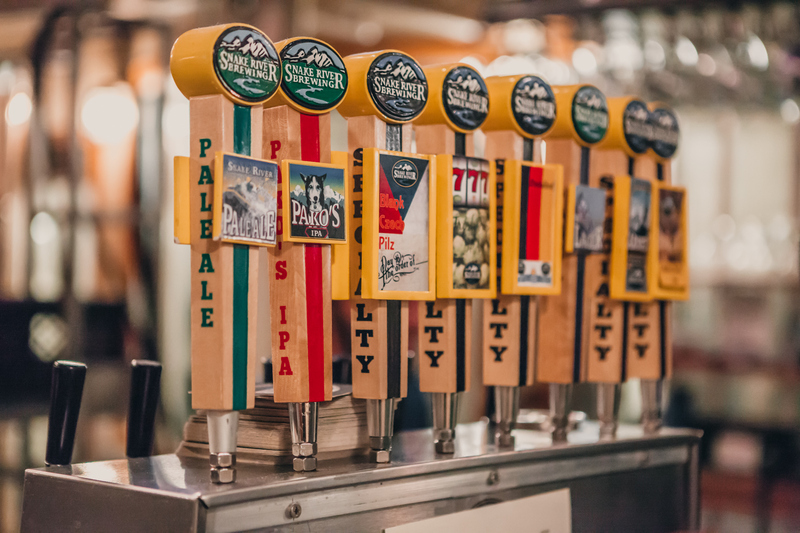 Depending on what ambiance, food, and style of beer you are looking for, our brewpubs will not disappoint! Heck, if you love beer so much you may want to hop around town and visit all of them! Here during Old West Days on Saturday, May 25th? Attend Brewfest! After a late lunch, you can either make your way to your hotel to take a nap (again, we won't judge you) or head over to the National Museum of Wildlife Art to calm your food + beer coma. With great exhibits coming in and out each season, you are going to love learning about the history and wildlife inhabitants of Jackson Hole. If you have yet to visit Jackson Hole Mountain Resort, add it to your list. Their famous Mangy Moose Restaurant and Saloon has an actual taxidermied moose floating above the seating area! Evening- Dinner time! What sounds good? EVERYTHING since you must be exhausted from your bike ride at high altitude and exploring the town of Jackson. When you think of Jackson Hole, you think of the old west, the mountains, cowboys, and national parks, but what most do not expect to see when they arrive is the exquisite dining scene. 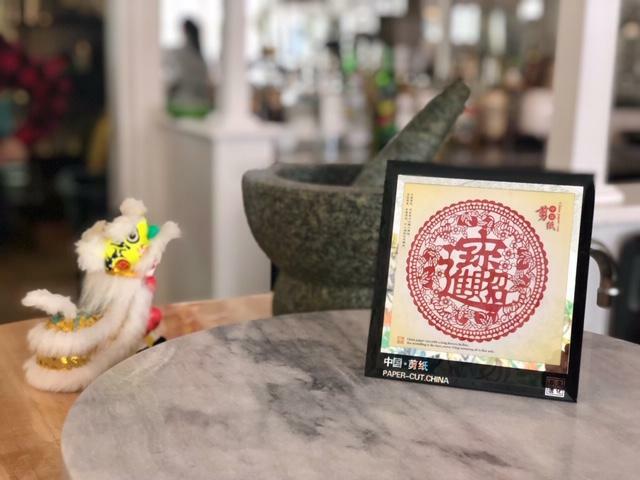 With a local fine dining restaurant group, local fast-casual spots, and local unforgettable dine-in options, you will want to try, like we said, EVERYTHING. To wrap up a fun-filled day, head over to the iconic Million Dollar Cowboy Bar, sit on a saddle, dance your heart out, and head back to the hotel for a good night's sleep--sweet dreams. And you can do it all over again tomorrow in America's first national park - Yellowstone National Park - full of geyers, hot springs, and lunch on the shore of Yellowstone Lake near the Lake Hotel. Morning- Knowing you, it's going to be an early one. You are ready to take on the day and do as much as you can until your legs feel like jello and your stoke is high. We get you, so that's why we suggest grabbing something on the go for breakfast AND lunch. Head into town or one of our markets to fill your pack with some savory and sweet treats and water. 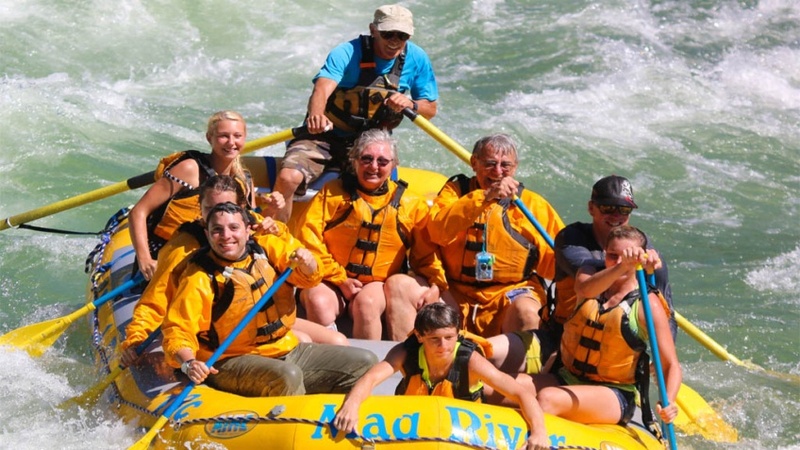 Once you've consumed your breakfast burrito in the car, make your way to one of our whitewater rafting businesses to embark on a trip along the Snake River. With a high-energy guide and paddles for everyone, you will have a hands-on, high-thrills experience. Keep in mind, during this time of the year rafting usually doesn't kick-off until May due to water levels and weather. 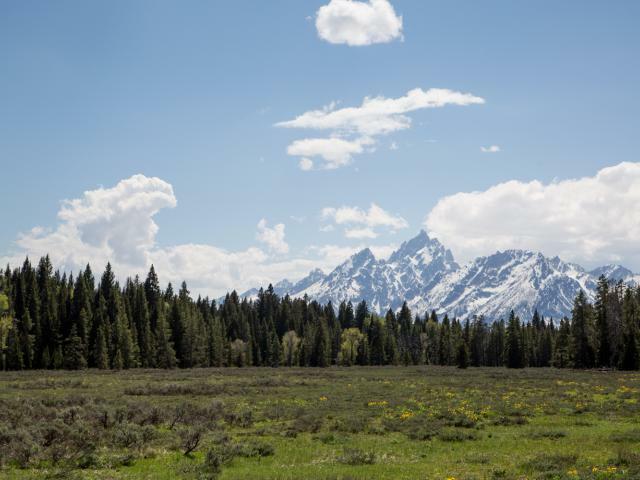 If you're our April adventurer, we suggest heading over to one of our bike shops and going on a long cycling journey from Jackson-Wilson-Teton Village-Grand Teton National Park. The views are out of this world, and you may stumble upon some wildlife on the way! Afternoon- After you've embarked on your river rafting or biking mission and have consumed all sorts of snacks, you've probably worked up quite the appetite and are ready for a late lunch. Since you want views of the Tetons as much as possible, we suggest heading over to Dornan's to take advantage of being right in the Grand Teton National Park entrance, sitting on a deck with the Tetons smack-dab in front of your face. Pizza and pasta will fill you up before your late meal, so dig in and don't forget to grab a beer r glass of wine from their fantastic selection. If you went cycling, then you're already right where you need to be. For our river rafters, head on your way as if you were going back to the Airport, but just drive a little further until you reach Grand Teton National Park--easy-peasy. You're full of pasta and full of ooo's and ahh's and are ready for the next adventure. Since we know you like the Tetons (I mean who doesn't?) and you like being active, we suggest taking on a local hike in town. Since we are still experiencing some snow melt, and again it is all dependent on weather, you can make your way to Snow King Mountain and head up to the top for the ultimate scenic view of the valley. There still may be a decent amount of snow, so you may make it half-way up or you can bring along some crampons to make sure you can trek through the snow up top. For those of you who aren't afraid of heights you could experience Jackson Hole from above! Jackson Hole Mountain Resort offers tandem and solo paragliding adventures. Evening- Time to celebrate! You've embarked on many journeys in one day and still aren't ready for sleep--way to go! The local night-out scene is a blast, so make sure you've eaten a big meal so you can stay out late and get some dancing under your belt. After you've regrouped and cleaned up at the hotel, treat yourself with a nice meal at one of the fine dining restaurant options around town. Whether it's a large piece of steak or many plates of sushi, you can have whatever your heart desires. Over dinner you'll get excited for the days ahead filled with adventure of a different sort - a once-in-a-lifetime wildlife safari in Yellowstone National Park. After you've gotten the grub out of the way and your plans for the days ahead, head over to the Silver Dollar Bar & Grill in the historic Wort Hotel and check out whatever free live show they have going on. Knowing them, they've probably got a great blue-grass or cover band playing tunes that will keep you on your feet all night long. Morning- Your kids are up and early and are excited to explore a new world. Before they can do so, they must eat a big breakfast so they have enough energy to take on all that Jackson has to offer. There are great spots to have a bite in town where you can sit down and enjoy a true filling breakfast. From waffles to pastries to cocoa and more, your kids won't be disappointed. Don't worry parents--there are also plenty of local coffee shops to get you caffeinated for the endeavors you're about to embark on. Now that the kids are fed and focused, now is a good time to head to the shops in town to grab some souvenirs and have them try-on some things before they lose steam. After you've made them try everything and picked out stickers and mugs galore, you can reward them with a trip to Jackson's local candy and toy stores. Up next? The Children's Museum, of course! The museum is a great spot to encourage your kids to examine the world together through interactive exhibits and programs in the arts, sciences, ecology, history, and more. Definitely will keep them occupied for a few hours, so don't forget to grab that coffee. Afternoon- After learning a lot at the museum, it's time for an early lunch before you head over to your next activity. The kids are wanting burgers, and lucky for them Jackson has plenty of options in that department. From beef to elk to bison, the choices are vast, but we're guessing they want beef. In town or on the outskirts, you'll be able to find the ambiance and menu you want! New last year, START brought on bike stations around town to make it easy and convenient to get around when you're short on time. So head over to a station using the app you'll need to download beforehand in order to unlock the bikes, and head over on a local's favorite trail: Flat Creek. A mellow ride through the gorgeous neighborhoods in town, this ride will offer your family some beautiful views with the peaceful sounds of the creek flowing. There are plenty of spots to take breaks, photos, and more. 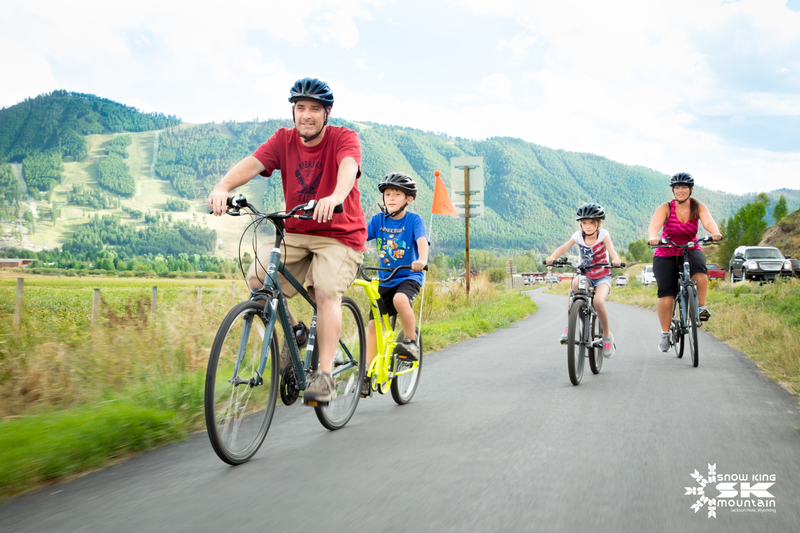 You could also ride the community bike path to Jackson Hole Mountain Resort and ride their famous tram to the very top of the famous ski resort. After you've returned your bikes at one of the stations, make sure to make it back to your hotel in time for your assigned pick-up time for your wildlife sunset tour. That's right, you heard us correctly. What better way to get amazing wildlife access than through a tour guide in a vehicle showing you all the top-secret spots you can see Jackson's inhabitants before the sun goes down! You can choose from plenty of different tour operators who will pick you up and drop you off at your hotel, making it hassle-free for you and your family. Evening-If your kids haven't already napped, now's the time since more festivities are on their way. If they're hyped up from all the animals they saw on the tour, then head right on over to Hole Bowl for some good old fashioned family fun. With a modern and family-friendly setup, you will have a blast bowling with the kids, drinking delicious local beer, eating delicious food, and playing arcade games. This is a great way to end the night after a long fun-filled day with the family, and just remember...they're definitely going to sleep well tonight. *Insider tip-Is your little explorer a park ranger in the making? At Yellowstone National Park's Old Faithful Visitor Education Center there is a kids’ room with a working model geyser. While there, the National Park Service Junior Ranger program for kids features science, art, and history projects. Students who complete the program can receive an official Junior Ranger badge! Our friendly and knowledgeable staff at our two visitor centers and the Jackson Hole Chamber of Commerce are happy to assist you with your vacation planning. For more information please email info@jacksonholechamber.com or call 307.733.3316.